The fate of New Orleans rests in the hands of a wayward grifter of a magician in this novel of gods, games, and monsters. The post-Katrina New Orleans of The City of Lost Fortunes is a place haunted by its history and by the hurricane’s destruction, a place that is hoping to survive the rebuilding of its present long enough to ensure that it has a future. Street magician Jude Dubuisson is likewise burdened by his past and by the consequences of the storm, because he has a secret: the magical ability to find lost things, a gift passed down to him by the father he has never known—a father who just happens to be more than human. Jude has been laying low since the storm, which caused so many things to be lost that it played havoc with his magic, hiding from his own power, his divine former employer, and a debt owed to the Fortune god of New Orleans. But his six year retirement ends abruptly when the Fortune god of New Orleans is murdered and Jude is drawn back into the world he tried so desperately to leave behind. A world full of magic, monsters, and miracles. A world where he must find out who is responsible for the Fortune god’s death, uncover the plot that threatens the city’s soul, and discover what his talent for lost things has always been trying to show him: what it means to be his father’s son. Bryan Camp is a graduate of the Clarion West Writer’s Workshop and the University of New Orleans’ MFA program. He started his first novel, The City of Lost Fortunes, in the backseat of his parents’ car as they evacuated for Hurricane Katrina. A phantasmagoric murder mystery that wails, chants, laments, and changes shape as audaciously as the mythical beings populating its narrative. […] The engaging style, facility with folklore, and, above all, impassioned love for the city its characters call home keeps you enraptured by the book’s most chilling and outrageous plot twists. A masterly game played by gods and monsters, a devastated city trying to rebuild, and compelling characters struggling to find their place in a strange world are all pieces of this fantastic and enthralling puzzle of a story. […] Camp’s thoroughly engaging debut is reminiscent of Neil Gaiman’s American Gods, with the added spirit of the vibrant Big Easy. “[A]bsolutely compelling, with plenty of twists [that] weav[es] a supernatural murder mystery filled with monsters, myths, and legends in this ode to New Orleans. Camp’s fantasy reads like jazz, with multiple chaotic-seeming threads of deities, mortals, and destiny playing in harmony. This game of souls and fate is full of snarky dialogue, taut suspense, and characters whose glitter hides sharp fangs. […] Any reader who likes fantasy with a dash of the bizarre will enjoy this trip to the Crescent City. Bryan Camp’s debut novel The City of Lost Fortunes is like a blessed stay in a city both distinctly familiar and wonderfully strange, with an old friend who knows just the right spots to take you to–not too touristy, and imbued with the weight of history and myth, populated by local characters you’ll never forget. You’ll leave sated with the sights and sounds of a New Orleans that is not quite the real city, but breathes like the real thing, a beautiful mimicry in prose that becomes its own version of reality in a way only a good story—or magic—can. You won’t regret the visit. With sharp prose and serious literary chops, Bryan Camp delivers a masterful work of contemporary fantasy in The City of Lost Fortunes. It reads like the New Orleans-born love child of Raymond Chandler and Neil Gaiman, featuring a roguish hero you can’t help but root for. It’s funny, harrowing, thrilling—the pages keep turning. 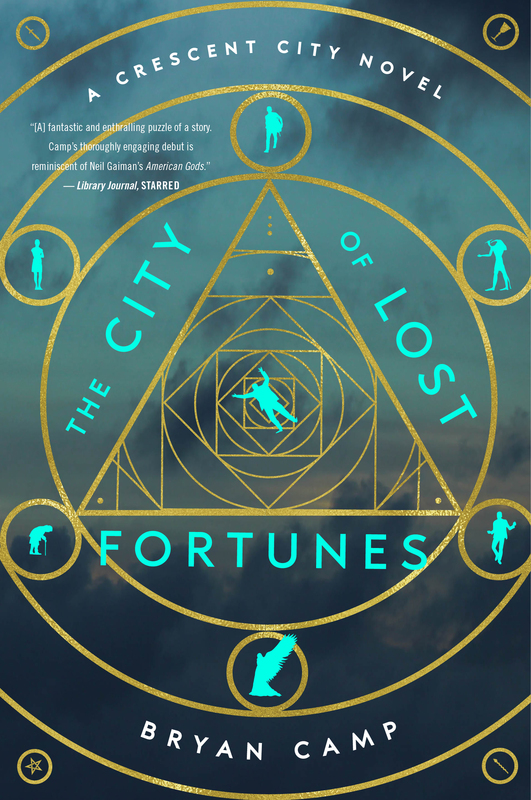 The City of Lost Fortunes establishes Bryan Camp as the best and brightest new voice on fantasy literature’s top shelf. A loving ode to New Orleans and everything that makes it superlative: the food, the music, the soul-crushing humidity, and of course, the people. Ambitious, insightful, and filled with commentary on the diversity and similarities across world mythologies, this novel is absolutely the product of a writer who is worth keeping an eye on. Anyone who loves New Orleans will love this mystical adventure where gods, magicians, vampires, zombies, angels, and ghouls clash in the only city where a story like this is actually possible. The City of Fortunes expertly blends the real and the surreal, capturing the essence of New Orleans in such a unique way. In this city, just as in this story, the line between fact and fiction blurs, and your imagination is set free. Myth and archetype combine with the gritty realism of modern post-Katrina New Orleans in this fast-paced novel. Throughout the twists and turns of a clever, compelling plot, the soul of the city and strength of its survivors shine through. As a southern Louisiana resident, Bryan Camp saw firsthand the devastation and impact on people’s lives caused by Katrina, and the emotion of that experience fuels the power of the story and its unique, well-crafted characters. If you like the work of Neil Gaiman and Roger Zelazny, you’ll enjoy this book. A fun, engaging read. Highly recommended.